talent, place orders, manage workflow and track performance. Find writers in minutes, place orders in a few more, and manage the workflow with super-simple tools. Get the expanded pool of pro editors, content strategists and translators with advanced workflow tools. Special tools designed to scale content marketing with team members, talent and clients. Quickly and easily find the perfect talent for your next project, with lots of ways to screen and communicate. Search for writers and review industry skill, samples experience, location and more. Launch Casting Calls to find talent with the exact experience and skill you need for projects. Launch a Writing Style Contest, and three writers complete the same order to compete for your business. Use artificial intelligence to find the perfect talent for you project using next-gen software. Connect directly with talent using our conference call technology that protects privacy. Communicate directly with talent and manage the back and forth with built-in software. Access an expanded pool of editors, content strategists and translators—all proven pros. Bring your own freelance writers to WriterAccess and we'll manage payments at a reduced fee. Order anything you need, including a library of free stock images and videos to boost visibility. Select the star level and price per word you want to pay for orders and projects. 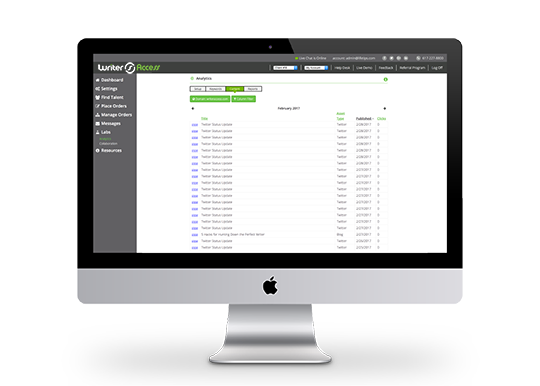 Placing orders is a breeze with order forms that help you articulate your requirements. Use our Creative Brief Wizard to clarify project goals, target audience, tone, style, and more. Leave a voice message with your order to help writers better understand your goals. Drop in keywords writers required for projects, and out software makes sure they're used. Specify any rules or requirements writers must "check off" before delivery. Name the flat rate price you want to pay for orders and projects. Access 700k royalty free high-resolution images or purchase Getty Images for $6/image. Access a libary of 80k royalty-free stock videos you can use and publish on your site. Use our customer Journey Map Wizard to document each stage of the journey. Our Buyer Persona Wizard helps you describe your target audience to help writers. Load up your keywords and drag and drop them in orders to make optimization easy. Manage the workflow with advanced tools that make content marketing fast and easy. Search for writers by industry skill, experience, location and more. Save time with a content planner and tools to discover hot topics, industry insights and more. Publish with one-click to HubSpot, HootSuit, WordPress, Yahoo Stores, Drupal and dozens of partners. Use folders, tags and download history tracking to stay organized all-the-time. Attach files to orders and store them in a file library for future reference. Team members are welcome to put the power of content marketing to work. Create buyer persona, customer journey maps and keyword maps in minutes to and more. Track the performance of all the content you create and impact on multiple domains. Agencies manage clients with ease with alert, portal and permission management tools. Agency clients get white–label client portals to approve content and request revisions. Advanced performance tools. Pro and Enterprise members. Drop in your ideas and transform them into orders, with clear visual display ideas, active projects, approved orders and published assets. Quickly view all the content you've published on WordPress, Facebook, and/or Twitter, with reports on views, clicks, optimization, and more. Track how well your keywords are performing in the search engines, and quickly access keywords to optimize content on orders. Track how well your content is performing and what impact your content is having on rankings, traffic, clicks and more.